Sold by White Kingfisher Ltd Australia and Fulfilled by Amazon. Gift-wrap available. 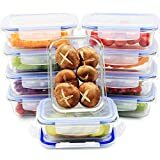 ★ MEAL PREP CONTAINERS – Each compartment comes with a very handy SmartestLock lid. Lock your container in two clicks to store your food without a spill. Completely leak-proof, you won't have any bad surprises carrying food around in your bag! ★ PREP YOUR MEAL AT HOME & EAT ON THE GO – What's better to eat than a heart-warming homemade dish? Prepare your own delicious and healthy meals at home and bring them to work or school. Our food containers resist high temperatures, so you can reheat or cook your food directly in them. They are also freezer safe! 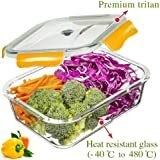 ★ HEALTHIER & STRONGER THAN PLASTIC – Our glass food storage containers are made from high quality borosilicate glass, which is stronger than standard tempered glass meal prep and plastic tupperware containers sold by other cheaper brands. Our borosilicate glass containers are oven, microwave, dishwasher and freezer safe, so they won’t crack, warp and leak nasty chemicals like plastic containers. The snap locking Lids and glass containers are BPA Free, FDA, LFGB, SGS, BV approved. ★ MEAL PREP RECIPE E-BOOK INCLUDED – We designed healthy meal prep recipes just for these containers and we packed them in this free e-book! All the nutritional information you'll need to keep on track with your health goals is in there. To make things easier, we've added links to the recipe videos so you can see how to prepare each recipe. If, for any reason, you don't receive your e-book after ordering, just contact us via Amazon, we'll gladly send you a copy! These glass containers are specifically designed for meal prepping to help you achieve your health goals. The containers are strong, durable and portable, perfect if you like to take meals to work. The locking buckles and silicone seal ensures that there are no leak or spills when in your bag. 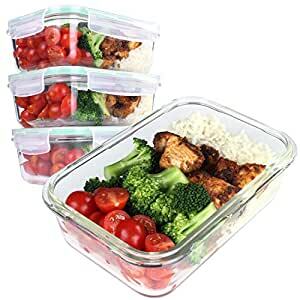 Meal prepping will save you money, using glass containers instead of plastic will save you a bit more money as you won't need to replace warped and damaged plastic containers. In addition, using glass containers instead of plastic is a healthier choice because it has no harmful chemicals that may contaminate your food and it's environment friendly! ★ Silicone Sealing Design-This makes it 100% leak-proof and airtight. We have created this e-book to help you get started with your meal prepping. All of the recipes are tailored specifically for these containers and show’s all the nutritional information. The e-book with be automatically sent you by Amazon when once you place an order. If you don’t receive the e-book it will be due to your Amazon settings not allowing follow-up emails. In this situation, please reach out to us and we will ensure you get it. Glass Base - Is made from High-quality borosilicate glass, it can be used in the oven, microwave, freezer and dishwasher. Plastic Lid - Is made from food grade pp lid and is BPA free. Lids should not be used in the oven or microwave. We recommend to hand-washing the lids to ensure longevity. The glass container holds up well, it is a minor inconvenience that the lids are not dishwasher safe, but not a big issue. They are water tight as advertised. Great quality will not be disappointed with purchase. Keep food fresh as a daisy.